Spacious rooms with ecstatic interiors is a favorite among holiday seekers with its soothing ambiance. 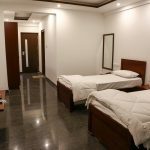 A completely air-conditioned, marble flooring deluxe room is a favorite among holiday seekers, which stands apart with its soothing ambiance with a balcony and unmatched hospitality. The Spacious rooms with an ecstatic interior, is spread over an area of 290 sq.ft.The spacious bathrooms are equipped with a bathtub, shower cubicle, loofah, all necessary toiletries and an in-room Jacuzzi. 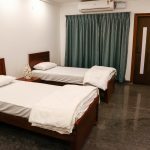 It is equipped with a mini bar, safety locker, tea/coffee maker, weighing machine, ironing board, laundry service, for your convenience. The WiFi, satellite TV and channel music only adds more value to your stay. There will be no refund / cancellation on bulk & group bookings / 100% refund if cancelled before 07 days of arrival (FIT BOOKINGS) / One day retention will be charged if cancelled between 07 days & 48 hours prior to arrival / Christmas & New-year bookings are Non Refundable / Non Cancellable/ Cannot Be Amended Once Booked / Incase of No Show The Hotel reserves Right To Charge Full Retention Charges.